Like its hero, Solid Snake, the "Metal Gear Solid" series appeared cornered after its second chapter. But, like Snake, it made a cunning escape with "Metal Gear Solid 3: Snake Eater." The 2004 installment of Hideo Kojima's landmark stealth series (revised in 2006 as "Subsistence") was a potent shot of adrenaline after "Substance" left players exhausted by puzzling storytelling. "Subsistence" not only reinvigorated the series with a more digestible and scaled back plot, it drastically refined its game play as well. As Naked Snake - the genetic predecessor of long-time "Metal Gear" protagonist Solid Snake - players parachute into the Russian jungle in the early 1960s to rescue a nuclear researcher from the Soviets before he can complete a doomsday weapon for their army. From the time period to the soulful, if over-the-top opening song to the curvy charms of femme fatale EVA, the game has all the makings of a James Bond movie. Many of the cutscenes are marred by the voice acting of David Hayter as Naked Snake, which sounds like he swallowed gasoline before he spat his lines. It's still somewhat tough to absorb the tale due to its abundance of secret agendas and double crosses between the U.S. and Soviet sides. But lacking the philosophical musings of "Substance" and their intolerable length, "Subsistence's" story plays out with much more intrigue. The game play receives a major refreshing due to the introduction of a camouflage system. 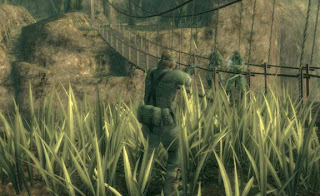 In Snake's arsenal are several outfits and face paint color schemes with which he can blend into the game's assortment of environments, from the overgrown foliage of the jungle to the copper-colored mountainside. Replacing the map players used to keep Snake out of his enemies' sights is a percentage index at the top of the screen indicating Snake's degree of invisibility. The result of this switch is a stealth dynamic that slows Snake's advance and requires more attention to his surroundings in order to discern the proper path through them. Simply running through the minefields of patrolling guards is no longer possible, players must often lie in wait and survey the scene from a safe hiding place as soldiers loom inches away. Though this game play model may test one's patience at first, it ultimately rewards in heavier doses through its heightened realism and suspense. The camouflage system of "Subsistence" is also to be credited for its most exciting boss battles. The first finds Snake in a sniper fight with an elderly master marksman simply named The End. Spanning three massively detailed forest maps, the battle can take more than an hour to complete as players scour that landscape for signs of their well-hidden foe. Snake, meanwhile, must cloak himself in the lush forest or fall under the fire of The End's tranquilizing darts. The resourcefulness, calm and strategy demanded by this duel easily ranks it among the finest boss battles in video game history. As the fight ensues players may curse The End and the game itself, but they'll probably want to face off again they've conquered him. The second standout boss battle is at the game's actual end, against Snake's mentor and paramour, The Boss. On a much smaller battlefield blanketed by white lilies, Snake must evade the hand-to-hand attacks of his more skilled enemy by hiding in the massive flower bed and catching her off guard. The remainder of the game's boss fights are a bit too easy and unimaginative, but mildly fun at a minimum. Another plate to balance in the boss battles is Snake's health, which is handled in an entirely new way in "Subsistence." Players must remedy each wound with proper care through a medical interface. The game also adds a stamina meter, which Snake must replenish through food captured in the Russian wilderness or else face dizzied aim and coordination. The relentless doting on both life bars is another dose of realism that livens up "Subsistence" with its new difficulties. By reinventing the "Metal Gear" series' stealth play and paring down the prominence of its story, "Subsistence" surpasses its immediate predecessor but still comes up a bit short of the ingenuity and brilliant design of "Metal Gear Solid." However, the third "Solid" leaves plenty of hope to subsist on prior to the June release of "Metal Gear Solid 4." The final boss: "Subsistence" scales back the bloated storytelling tendencies of previous "Solid" titles and breathes new life into the series' stealth game play.